Earlier today, British Prime Minister Theresa May stepped to the podium at Lancaster House in London and set out 12 guiding principles for the UK’s departure from the European Union. The debate continues in Britain as to whether foreign students should be included in the country’s net migration targets. Immigration is a major political issue in the UK, however, and the government continues to give every indication students will not be excluded from the net migration figures. In recent months, the government’s position on this question has in turn given room to considerable speculation about further visa controls. In an October 2016 conference speech, Home Secretary Amber Rudd indicated that new visa rules were in the works. The Home Secretary also set out a case at the time for a two-tiered visa system, where visa policy would be linked to the quality of the programme or institution. More recently, The Guardian has reported that the Home Office is considering dramatic reductions in the number of visas available to foreign students. These recent reports provide the backdrop for a new analysis released last week by the Higher Education Policy Institute (HEPI). Reflecting a variety of assumptions and projections with respect to relative currency values, tuition rates for EU students, and student immigration levels, the HEPI concludes that any new restrictions on foreign student mobility could cost the British economy up to £2 billion per year (US$2.5 billion). For the moment, foreign enrolment in the UK remains essentially flat. The latest data from the Higher Education Statistics Agency (HESA), also released last week, shows that total higher education enrolment in Britain creaked up by 1% in 2015/16. Foreign students – whether from the EU or not – accounted for nearly 20% of that total. 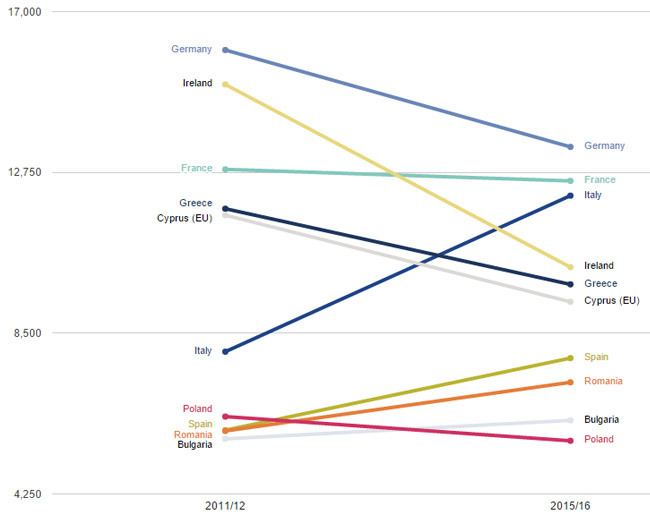 HESA finds, on the strength of notable declines in German and Irish enrolments in particular, that EU enrolment across the UK fell by 4% between 2011/12 and 2015/16. As we also reported recently, this pattern may well extend into 2016/17 and 2017/18 as the number of EU students applying in early UK admissions cycles this year has fallen off by nearly 10%. In terms of non-EU students, HESA reports that overall enrolment fell off by 1% in 2015/16. India registered the largest decrease (-48%) over the five-year period from 2011/12 to 2015/16, a drop that equates to more than 13,000 students. 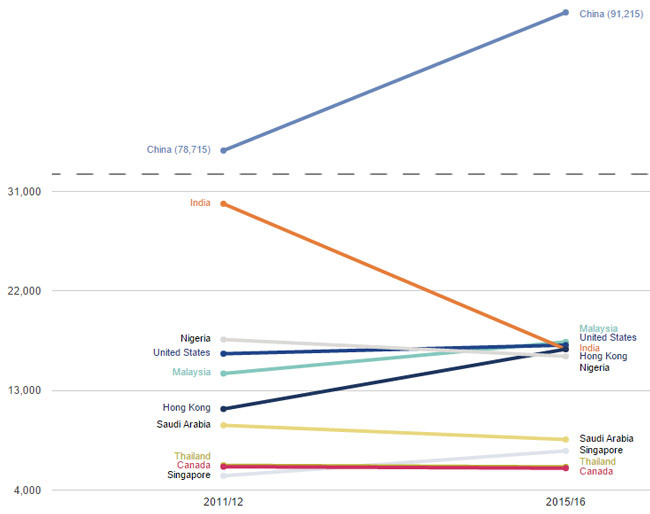 As the following chart reflects, Malaysia has now edged into the number two spot among leading sending markets for the UK, partly due to India’s decline but also because of real growth in Malaysian enrolments over the last five years. That notable decline in Indian enrolment stands in sharp contrast to the experience of other major study destinations. The US, for example, has recorded a 60% increase in Indian students since 2010/11. And while China remains (by far) the largest non-EU sending market for UK higher education, the 35% increase in Chinese enrolment since 2010/11 pales in comparison to the more-than-doubling of Chinese students in the US over the same period. More broadly, the US, Canada, Australia, China, and other leading destinations continue to outpace the UK in terms of year-over-year enrolment growth. Particularly in view of the growing strength of major regional destinations – such as Russia, China, and South Africa – the continued erosion of the UK’s market share through 2015/16 is a troubling and persistent trend to set against the looming Brexit process as well as the prospects of new student visa rules from the British Home Office. This entry was posted in Europe, Higher Education, Immigration, Most Popular, Regions, Research, United Kingdom and tagged universities with international students, higher education statistics, UK universities, UK immigration, undergraduate admissions.